Image caption Does this look real to you? Last year a new Japanese celebrity burst onto the scene. But "Saya" was a different kind of star, because she is the product of a Tokyo computer lab. And like all "parents", her creators have big ambitions for her, writes the BBC's Yvette Tan. "'I think I've seen her somewhere' or 'She looks like someone I know' are what people usually say when they see Saya," says Yuka Ishikawa, one half of the husband and wife graphic artist team behind Saya. 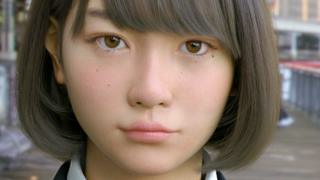 When the couple first posted pictures of the hyper-realistic schoolgirl online last year, it was a revelation about what can be achieved with computer design. Her slightly askew school tie, heavily fringed hair, freckled skin and teenage pout left thousands trying to work out whether or not she was a real person. Since then, the couple have spent a year perfecting their creation, resculpting and moulding her face, and have now released a new and improved version of the schoolgirl. "Saya has come a long way since her birth. In order to make her more human we have been reworking her from head to toe", Mrs Ishikawa explains. The reaction to the new level of detail seen in Saya has been almost universal astonishment. "I can't see anything but a real girl in this image", said one user on Twitter. "I can't wait to hear her voice and see how she moves", another commented. "The level of realism is absolutely amazing." "Though we never thought of ourselves as Saya's parents, we created her with love and affection as if she was our daughter," Mrs Ishikawa told the BBC. Saya was inspired by many girls that Mrs Ishikawa saw around the area of Shibuya in Tokyo, a popular hangout spot for teenage girls. Her facial expressions, movements and personality reflect those of a 17-year-old, though she has no specific age. As well as drawing her features with incredible precision, the couple also bestowed upon her all the qualities considered positive in Japanese women. "She is humble and kind, a good student with a strong set of morals and ethics," said Mrs Ishikawa. "We also focused on the Japanese idea of kawaii or being cute - she is the modern representation of kawaii." When the couple first started creating Saya, she was a side project, destined to be a character in a short movie. But they were overwhelmed by the positive response when they first presented her to the public. "We saw her potential," said Mrs Ishikawa. The couple then decided to give up their day jobs and focus entirely on developing Saya. "We've been living off our savings," Mrs Ishikawa explained. "We've also been getting corporate support along the way." This week they debuted the first animated version of Saya at CEATEC, a consumer electronics exhibition in Japan. The short clip is arguably less impressive than the still images, and Saya's movement seem a little jerky, but it's a big leap forward for the character. "One of the most difficult tasks we face is making Saya's movements appear more natural and spontaneous," said Mrs Ishikawa. And the couple have plans for more with Saya - they want to develop her into a proper virtual human. They hope that one day Saya will be able to interact with humans, perhaps even being able to provide emotional support to those in need. "Until now we have observed Saya's world through devices such as displays and screens," said Mrs Ishikawa. "By utilising state-of-the-art technologies, it is possible for Saya to 'break through the frame' and engage with the real world. "It will be interesting to see how she is received as people become aware of her."